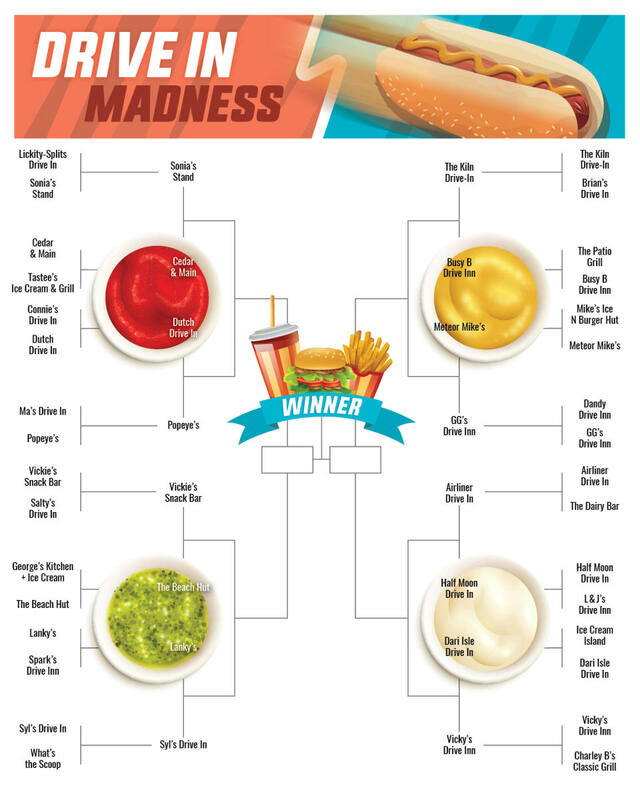 Whew, round 1 was a messy battle of burgers and buns, but we made it to the Sweet Sixteen round of Drive In Madness! In the Ketchup Division, Lickity-Splits Drive In made like its name and ran lickity-split out of the competition. Cedar & Main crushed Tastee&apos;s cone (so tragic) while Dutch Drive Inn sent Connie&apos;s packing and Popeye&apos;s bid adieu to its worthy opponent, Ma&apos;s Drive In. Meanwhile on the Relish side of things, we saw two close calls as Vickie&apos;s Snack Bar and The Beach Hut narrowly defeated the competition. Today, the people of Hamiota are saying WTS!? (What the scoop?!) after a crushing defeat by Syl&apos;s Drive In, while Lanky&apos;s kept a 2-foot-long hotdog&apos;s distance from Spark&apos;s Drive Inn as they pushed their way to the next round. The Mustard Division saw new rivalries take hold as The Kiln defeated Brian&apos;s Drive In, Busy B Drive Inn hurried The Patio Grill out the door, Meteor Mike&apos;s crashed into Mike&apos;s Ice N Burger and GG&apos;s Drive Inn said gg to Dandy Drive Inn. Lastly, the Mayo Division had a dramatic finish as the Airliner Drive In flew through to the next round and Half Moon rolled up in a 1959 Cadillac (show offs). Dari Isle Drive In held its little slice of paradise against their rival Ice Cream Island, while Vicky&apos;s Drive In left Charley B&apos;s Classic Grill and Ice Cream Parlour in a condiment nightmare. Thank you for your votes - let&apos;s keep it going for another round! Voting closes on March 24 at 11:59 pm, with the next round going live on March 25.